We put at the client’s disposal, the Modular Operating Room Systems that are designed for assisting the health care departments to maintain the clean & contamination-free environment. Our veteran professionals make these Systems with complete precision so as to comply to ISO standard 14644-1. Available in the customized specifications, these Modular Operation Theatres are nominally priced by us. 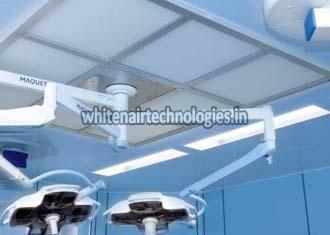 Whitenair has developed special understanding for the technical and convectional requirement found in operating rooms. It was on the basis of this expertise and a view towards the requirements of the future, that whitenair was created. This Modular operating room system adapts to fit whatever space might be available; it is equally suited for new construction and for rebuilding and expansion project this makes the system future-proof and that has a significant economic impact for hospitals over the long run. Examples of this sustainability include flexibility, time savings and confidence for investments. Whitenair Provide You the best critical environment solution that are cost effective in tight time scale as being specialist in Clean room HVAC system we offer complete support from planing, designing to production, installation to after sales services. We can provide customized air containment environment solution.